A mesmerizing and controversial bio-pic. This seems to be the year for the biographical motion picture. Universal Pictures and Legendary’s Steve Jobs takes you on a journey through the most signifiant product launches of the late co-founder of Apple’s career. Despite the fact that Jobs is revered as a genius and one of the most influential men in American history, this movie does not shy away from painting an accurate portrait of his personal and professional life. Although he is loved and admired by so many people, his character is one that you will most likely dislike through most of the narrative. From open to close, you will be glued to your seat in awe and surprise. This is definitely one of the most intriguing and intense bio-pics I have seen in a long time. Throughout the narrative, there is a constant theme of control and design. Complete with a brilliant cast and impeccable writing, this is definitely one to watch out for at the next Academy Awards. Steve Jobs is about the early career of the co-founder of Apple. You will go on a journey through the most important product launch successes and failures of Jobs’ (Fassbender) career. From being fired from the very company that he co-founded to the love-hate relationship he has with his daughter and the hatred for her mother, you will learn what prompted Jobs to make the decisions he did and how each decision affected his relationships with friends and colleagues. Discover why “end to end control” was so important to the designs of the MacIntosh and Apple computers. Michael Fassbender truly shines as the genius behind Apple’s phoenix-like return from the ashes of its darkest days. Not only does he resemble Jobs in appearance, but he also captures the very essence of what made Jobs tick and why he became the success he was professionally. Fassbender also delivers powerful performances in his altercations with colleagues and his presumed family. The intenseness of his conflicts and triumphs transcends the screen and compels your attention through the entire film. Often in movies, you either want to love or love to hate the protagonist; and that element rings very true in this film. For nearly the entire movie, I hated Steve Jobs. Funny, because I use all Apple products. But, during the end of the third act, I made a radical shift and saw the glimmer of hope that has caused millions of Apple fans to adore him so much during the latter years of his career. More than anyone else, he believed in his designs and methods of product launches. Only his director of marketing Joanna Hoffman (Kate Winslet) seemed to be the one he confided in most or could control the man who was insistent on “end to end control” throughout his dynamic career. Winslet also delivers a commanding performance as Hoffman who stuck by Jobs from product to product, advising him when he wouldn’t hear of anyone else’s opinions. She is the single person who held helped the public not to despise him as much as most everyone else did behind the scenes. So often I find that bio-pics can tend to romanticize the protagonist by glossing over the more negative events of his or her life. Not so with Steve Jobs. The remarkable element of the writing is the commitment to reality and just laying all the positive and negative events and encounters out there for the audience. Highlighting the more negative events is extremely important to this film because that is where the very dynamic character arc comes from. If you loved or hated Jobs the entire time, it would not be nearly as impactful. But because you will likely hate him for most of the movie until the end and then quickly turn a 180, that is where the magic of this movie lies. There are times that you think that he will budge from his stances on design teams and products, but then he is just as stubborn or relentless as he is throughout the story. Oddly enough, his penchant for complete control is what tanks and then resurrects the tech company. 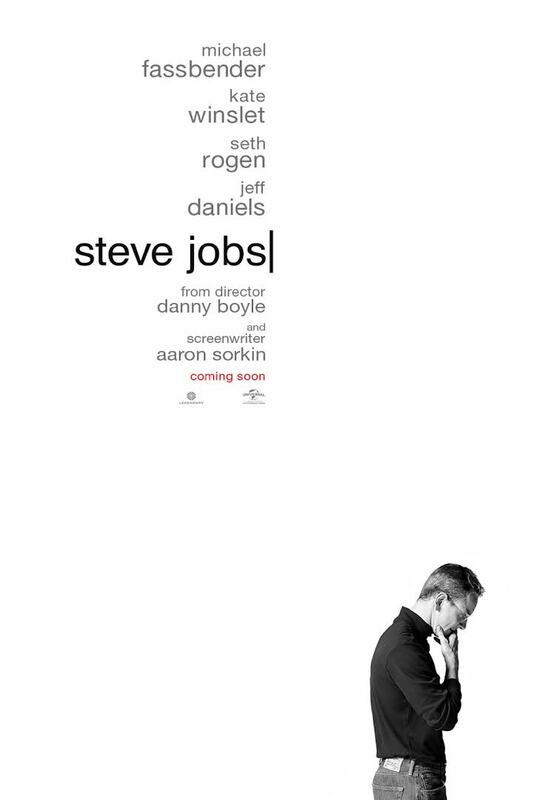 The story is gripping and whether you are an Apple product fan or not, this movie is an excellent example of how a completely candid bio-pic can still prompt the adoration of the public despite the dark elements and poor decisions in relationships with friends and lovers. If you are an Apple product fan, this is definitely a film to catch because it takes you behind the sleek product displays and technology launches. Learning about Steve Jobs the man actually gives a new-found appreciation for the company he helped start, got fired from, and rehired again. The amazing cast and brilliant writing enables this film to be admired for its commitment to the art of biographical motion pictures.